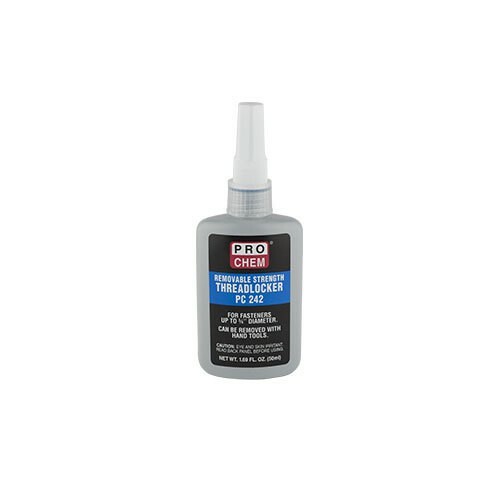 THREADLOCKER PC 242 | Pro Chem, Inc.
THREADLOCKER PC 242 is a medium-strength, general-purpose fastener adhesive. Cures only after adhesive is confined between mating surfaces. Will withstand temperatures of up to 300°F and most solvents. Eliminates the need for stocking lock washers, plastic inserts and locks, machine access bolts and hydraulic system bolts. Locks and seals while preventing parts from loosening due to vibration. Performs well on aluminum, steel, plated fasteners, stainless steel and special alloy parts. Ensure parts are clean, dry and free from oil and grease. Twist off white over cap and snip nozzle to desired length. Hand apply from the bottle onto threaded parts and assemble. To remove, use hand tools.